When I saw my father-in-law reading this book I commented that it looked interesting and so I was graciously given the book when he finished reading it. It is the story of how the American colonies became the United States and then how they separated from Great Britain and issued their Declaration of Independence. The author is an Ivy League professor at Pennsylvania University and has taught on this subject for many years. His writing is exceptional and causes you to turn page after page, even in a history book! The contents of the book are rather well-known and so I will not give a long list of details. 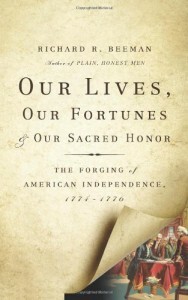 The author begins with certain grievances that the colonies had accrued from 1763-1774 against the British government. These grievances continued to mount and led to a more and more unified resistance. Eventually there was called from each colonial government representatives to meet in Philadelphia to discuss the proper course of action. These debates, the personalities and the politics involved, the decisions made, the British response, and the enormous consequences of it all make up the bulk of the book. One thing that struck me was the American founding fathers’ appeal to natural divine law and the fact that the British had violated it. I was struck also by their own careful adherence to it. This meant that they not only held the British responsible, but they went out of their way to be sure they followed the correct procedures in accord with that natural divine law. Therefore they would not do something so rash as declare independence without first submitting grievances, having proper organization and representation, having sufficient discussion, finding sufficient unity, and of course being consistently denied their “unalienable rights.” There were some who opposed independence to the very end and even John Dickinson who refused to ever sign on to it. Even though these argued against independence and stayed true to their principles they recognized that since the proper course of action had been taken, since no other option except independence presented itself, and since unity in such an endeavor was vital they (even John Dickinson) wholeheartedly and tirelessly applied themselves to the cause of independence after the Declaration was issued. Such was principle for those men and such was the “sacred honor” that the author borrows from the Declaration of Independence and puts in the title.